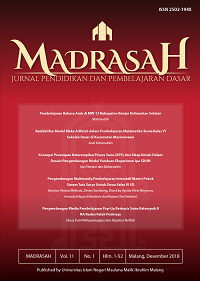 Madrasah: Jurnal Pendidikan dan Pembelajaran Dasar is a journal published by Laboratorium Journal FITK UIN Malang, published twice a year in the June and December periods as a vehicle for scholarly communication in primary education and learning. Editors invite experts and academics to contribute texts, both in the form of conceptual ideas, application of theories, the results of educational research and teaching of elementary school, and literature review that is in line with the fundamental disciplines of education and learning. Focus and scope of Madrasah: Jurnal Pendidikan dan Pembelajaran Dasar is Development, and Design of Learning on Madrasah/Elementary school, Learning Strategy on Madrasah/Elementary school, Learning Evaluation on Madrasah/Elementary school, Education Management of Madrasah/Elementary school, Inclusive Education on Madrasah/Elementary school, Integration and interconnection based research on Madrasah/Elementary school, Teachers professionalism on Madrasah/Elementary school, Information and digital technology on Madrasah/Elementary school, and other relevant topics on the focus of Madrasah/Elementary school. The manuscript that loaded is the original manuscript and has never published with a maximum minimum of 20% similarity check. Instructions for Authors :Authors should submit only papers that have been carefully proofread and polished. Manuscripts are accepted with the understanding that they are an original or extended version of previously published papers in conferences and/or journals and that, if the work received an official sponsorship, it has been duly released for open publication. Before submission please make sure that your paper is prepared using the journal paper template. The authors must refer to Madrasah: Jurnal Pendidikan dan Pembelajaran Dasar for writing format and style (Please download and use as the MANUSCRIPT TEMPLATE for initial manuscript submission). This will ensure fast processing and publication. Any papers not fulfilling the requirements based on AUTHOR GUIDELINES and REVIEW GUIDELINES will not be processed/ Rejected by the editors before further reviewed. We strongly prefer to receive manuscripts via our ONLINE SUBMISSIONS system. Using this system, authors can upload manuscript files (text, figures and supplementary information, including video) directly to our office and check on the status of their manuscripts during the review process. First, kindly please register as the author follow these REGISTRATION INSTRUCTIONS, and then you should login to submit your papers. Please don´t forget tick author when you make a registration. Registration and login are required to submit items online and to check the status of current submissions. If you have any problems with the online submission, please do email to madrasah [at] uin-malang.ac.id (subject: Your Name_Problem with Online Submission), and cc: irfan.islamy87 [at] uin-malang.ac.id.